Parking ‘Soto in the city for a few hours, Gizmo and Fluffy endeavor to hunt down some lunch on their meager bank accounts. Gizmo despairs that they only have enough cash for bread and water, but Fluffy tells him not to be discouraged. Spotting a Robot Expo at the local convention center, Fluffy figures they might be able to score some free hor dourves. Navigating the booths in search of grub, Fluffy is approached by an alien entrepreneur who inquires as to the model of his robot servant. Gizmo is incensed at the slight, but Fluffy quickly silences his pal with a smack to the face. Fluffy tells the alien that he represents Brockelton, ‘Soto and Sprocket Robotics, Inc. and that his robot servant is a brand new prototype not yet ready for the market. Gizmo continues his outrage, but Fluffy muffles his protests with a headlock. Fluffy says that this prototype is for a limited run series and, as a result, only very few preorders are being accepted. The alien is quickly snookered by Fluffy’s scam and drops 150 of whatever currency they’re using to ensure himself a preorder. Getting a load of the wad of cash, Gizmo promptly shuts up. Leaving the Expo, Fluffy offers to treat Gizmo to lunch. Gizmo, still astonished at Fluffy’s skill, calls his friend “an artist”. *Among the robots at the Robot Expo are R2-D2, Robbie the Robot, the robot from Lost in Space, a Dalek, Maria from “Metropolis” and the Fugitoid. Gizmo and Fluffy will properly meet the Fugitoid in Gizmo and the Fugitoid #1. 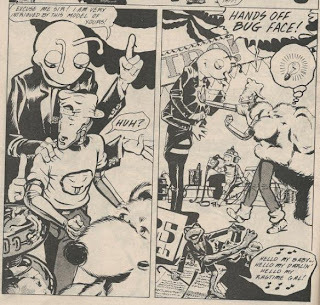 *The alien that Fluffy scams is designed after the lead characters from Kevin Lenagh’s Domino Chance comic, where Gizmo’s adventures were first published. *An advertisement for TMNT can be seen (partly cut off) on Page 1. *This story was reprinted in The Collected Gizmo trade paperback (December, 1988). 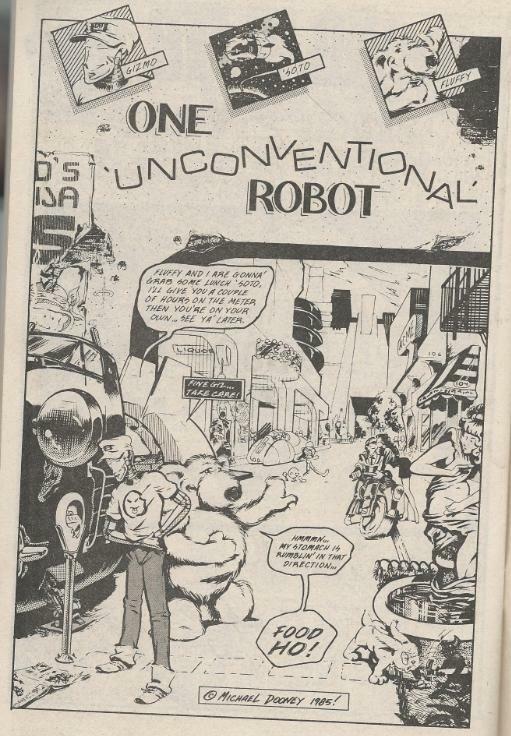 “One Unconventional Robot” is another early installment in Dooney’s series of Gizmo shorts, before the ongoing would come along and hammer out the rough edges of the characters and their ethical compass. Keeping in line with the earliest installments, Gizmo and Fluffy are presented as morally ambiguous schemers out to hoodwink whoever is gullible enough to fall for their shtick. In this case, Fluffy plays the con-artist and dupes an alien into forking over 150 bucks for a fake preorder. I rather like these early tales, where the pair were a bit more amoral if still generally good-natured. Fluffy, being the bruiser and tough guy of the duo, seems intended to take the edge off of Gizmo, if ever so slightly. Were Gizmo to play it solo, he'd be forced to contain all the negative attitudes and occupations of a scam artist and thief; the introduction of Fluffy allows those negative qualities to be split amongst two entities. So instead of one irredeemable crook, we end up with two rascally scamps and that works out better for everyone. The highlights of “One Unconventional Robot” are the considerable number of Easter Eggs Dooney slips into the background of the convention. I only listed a few in the notes section of this article, but I’m pretty sure that there were more that I couldn’t quite place. Some of the cameos are even more in your face, such as Michigan J. Frog of Looney Tunes fame singing his famous ditty (you know the one). So while the main story gag is far from a knee-slapper, you’ll pour over the 5 pages again and again just to digest the artwork and hunt down all the hidden goodies.